Nathan Jurevicius was born in 1973 in Bordertown, Australia. Bordertown is a small South Australian town near the Victorian border. Bordertown is a place which is well-known for its meat factory and also the birthplace of Bob Hawke. He had his first one-man show, selling three pieces, including the legendary ‘Woman with a fly on her nose in a phone box’ at the age of six. It is also famous for its white Kangaroos. And now Nathan is an artist with sell-out shows around the world. 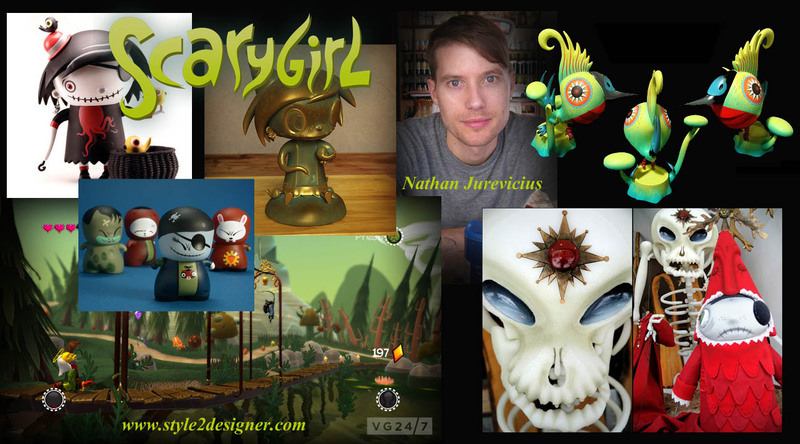 Scarygirl is his most well-liked character with online humorous games, animation, illustration artworks and prints, and a range of toy albums. Nathan is an Australian artist working in a variety of media….. Nathan Jurevicius has employed as a freelance illustrator and artist for a lot of International Corporation and publications. Nathan patrons includes – Nickelodeon, Scholastic Inc, The Financial Review, Zinkia Entertainment, Subaru, Comedy Central, Allen and Unwin, Fuji, MTV, The Wall Street Journal, ABC, Warner Bros. In the year 2002, he created the interactive animated cartoon. Nathan was completely inspired by the Slavic mythology. His top much-admired project is Scarygirl. Scarygirl is cute but somewhat funny little girl who was dumped late at one night and is later found and caught up by a friendly octopus and directed by a mystic rabbit. The world of Scarygirl is a hallucination that is packed with popular soul colors, fantastic work of art and genuine stories that recollect myth and tradition from our shared cultural remembrance. The brand since its creation in 2001 has developed an underground following of fans all around the globe through its funny animation, illustration, designer toys. Then Scarygirl was preferred by the producer Sophie Byrne who was the Oscar award winner of Passion Pictures for the year 2004. The property is now in live draft and visual expansion for an animated feature film. Nathan has also finished his initial graphic novel based on Scarygirl, launched by Australia’s foremost Independent publisher Allen and Unwin. It was circulated in North America by Last Gasp and ARX in Brazil. The graphic novel has since acquired different awards including Award for Best Illustrated Book/Graphic Novel, the 2010 CBCA Notable picture book list and included in International Youth Library’s The White Ravens 2010 which is a yearly collection of wonderful volume for children and young adults. Nathan infrequently works together in a design collective producing limited edition products and art exhibitions with Andrea Kang. Nathan’s newest project entitled ‘Peleda‘ is presently in early construction for the Australian Broadcasting Corporation.